Heavyweight, 10-color, twisted heat set olefin. 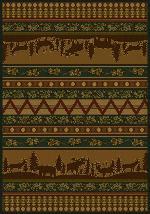 Pine Valley Rug Series design is a complement of color, style, versatility, and value. An antique/traditional color palette gives each design a true, rich, hand-made look ideally designed for your cabin, lodge, southwest, decor. Stain, soil, odor & fade resistant. Maintain with simple vacuuming. Fiber: 100% Olefin (Polypropylene) In-stock usually ships within days.